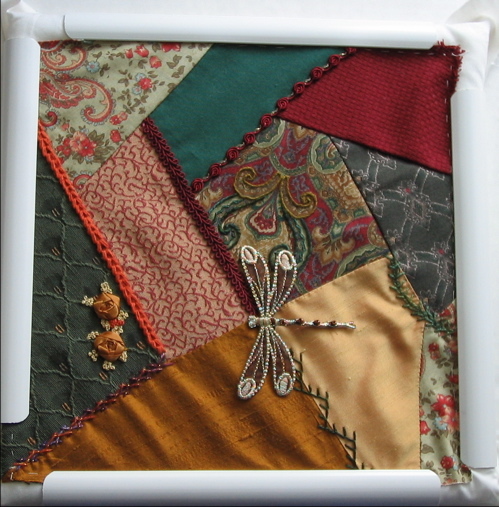 Adding trims, seam embellishments and beginning the sectional embellishments. Decided that the next step would be the braids. I am NOT a lace type of gal, but braids are good. I had 2 bits of wine braid -- a "V" braid and a link of roses with a bit of gold. Those who know me know that there will usually be roses some where, some how. I put the braids on where the braids told me to put them. Thus, most of the original planning shown on the prior page is out the window. Hope this doesn't create a flow problem later, but the braids really looked best where they are placed. Actually, if there is a braid or stitch line in the way of the flow - I can just stitch over it. By continuing the design over and onto both sides of the line, the line should not be an impediment. We shall see. Was feeling very stuck with what stitch to do, what thread to use, etc. So... I gave my self permission to play. Just pick up a thread and tryout a stitch. What could happen? It might work or might not. If not, then either unstitch or play with it until it was right. Thus, this became an exercise in empowerment and freedom of thinking/creating. I also think environment is very important. I have my stitching corner which has good light and supplies nearby or at fingertips. My stash is within arms reach, so I can pull threads at will. I am bad in that I like the corner of the couch, which some say eats people, that is very nest like. The entertainment center is across the room if I want a movie or music. Frequently I have feline assistance with the stitching. Finally opted to do the stitching using Q-Snaps. I need to adjust them frequently to do the edges and keep the tension, but they are working quite well. Putting the first stitches on anything is always the hardest. Decided to start with doing a herringbone stitch - double - forward and back/reverse. I had a sample of Overture which I stranded into 4 and used one. The herringbone still needed something especially as matte as the thread is, but it would come. Been wanting to play with ribbon embroidery for a while now. I had picked up a scrap of golden brown ribbon which became ribbon roses on a base of Weeks Dye Works 1223P5 - an overdyed gold #5 pearl. It took about 1' of ribbon for 1 rose of about 5/8" diameter. Next to hand was some pale gold Gloriana silk scrap thread. I stranded the 12 down to 3 and did some French Knots around the roses. I think this will form part of the flower spray which will play across several of the fabric pieces. Next, was looking through the Mary Thomas Embroidery Stitches by Jan Eaton (Tom Pudding Designs) to get ideas. I've been wanting to play with some of the composite stitches so tried out the Portugese Border Stitch. The base is Mandarin Floss M830 (a rich brown) and the stitching which is totally above the fabric is in Mandarin Floss M815 (a pumkin). The floss is strandable, but I used the whole 6 together. Thanks to Linn Skinner for the Mandarin Floss to try out. It is made from bamboo and has some sheen to it. Neat stuff to use so I used the remaining part in my needle to make a few French Knots around the roses. When flipping through the Mary Thomas book, they show herringbone whipped. So got out the Kreinik fine Jap gold and whipped each of the intersections 2 times. YES! now I'm happy with the herringbone. Will still probably do more to embellish it, but it works! Still fumbling around about what stitch and thread to use where. Picked up the Weeks Dye Works 1276P5 - an overdyed middle green from yellow green to blue green #5 pearl and tried out the Wheatear Stitch in a curve. Interesting. Lots of possibilities. The thread feels almost too matte, but okay for a base bit. Back to silk. When in doubt use silk thread just for the hand feel. Silk N Colors Dark Forest Green - also an overdyed, middle greens with blue and browns. Having never tried Fly Stitch or Feather Stitch, decided the time had come. Used 2 of the 6 threads. Cool effect!. Want to do more with this line of stitching. 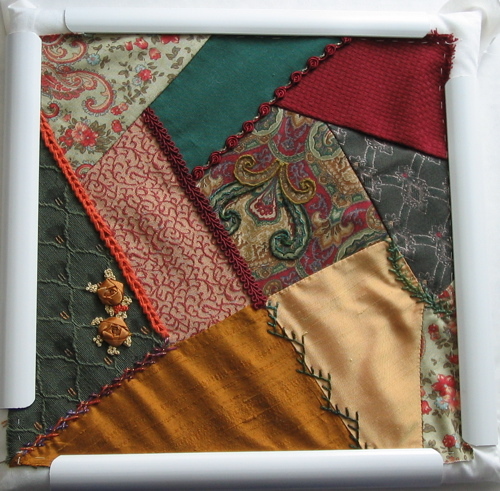 Then off to play with embellishing the pattern of the arabesque. Had planned to do lots of this, before I had to cut off some of the motif. Used 2 threads of the same silk to do Outline Stitch and then one thread to do a modified herringbone inside of the furled bit. Used Mandarin Floss M818 (an olive green) - 3 of 6 plys to do the lower furls. There will be more, but bed time called. Was visiting our local yarn shop, Fengari, which is one of THE yarn shops on the west coast and found some hand dyed silk ribbon from Patti Subik/The Great Adirondack Yarn Co. One skein (45 yards) was in yellow, green, blue, purple, and wine and the other gold, green, violet, purple, blues (for the next quilt project). Unfortunately the ribbon is wide - about 10 mm. I can make it work for some bits. I also need to give myself permission to use some of the silk ribbon that I dyed in a class with Anne Frazier (Gloriana Threads). Had planned on keeping the fabric, threads and silk ribbon together for a project, but think this project needs some of them. Something called me to stop into the not so local JoAnns on Monday after work. I thought I had gone in for serger needles, but apparently not. They had a couple packages of light yellow green silk ribbon which I added to my basket. Then a couple of aisles away they had prepared motifs bits from India - on sale 30% off. There hanging by itself, was the dragonfly. His wings are a golden brown silk gauze. Iridescent metallic threads and brown beads decorate the body and tail. It was the perfect piece to add to the block to make it come together! In this picture it is laying where I think it will go. I want to do a lot more to the block before I put it on and then probably another layer or 2 to embed the dragonfly into the block. Meanwhile, he makes me smile. All the books shown below are available through Amazon.com This is not an endorsement, but merely a piece of information on a source.